Subscribe to access all D1 ref data. Hot Links: NCAA Tourney Tracker. High School top teams rankings, coaches and players. Sources: wikipedia and USAToday, 2016/17,2017/18 updates pending. 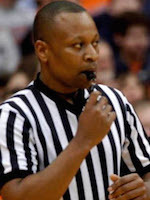 If update does not appear within 24 hours, please send an email to webmaster@phillyref.com with referee name and home state, your name, any comments, and any photo attached. Asheville, nc March 1-5 E. Tenn. St.
Sioux Falls, sd March 3-6 S. Dakota St.
Houston March 6, 9, 10 Texas So. Las Vegas, nv March 7-10 New Mexico St. ?? ? ?r ?? ?? ?? ?? ?? Nov. / Dec. / Jan. / Feb. / Mar.